I have about 100 recipes and counting I want to try from old cookbooks as well as new cookbooks, not to mention all the recipes I have saved from various blog posts and websites. 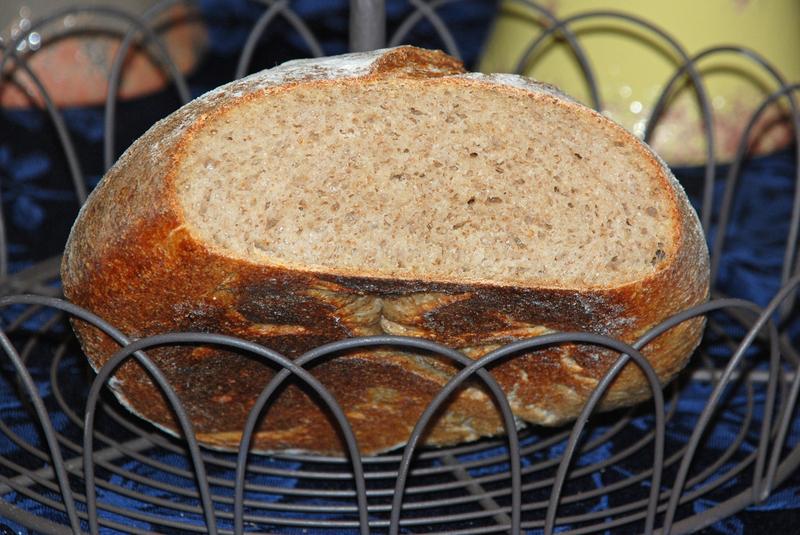 Having said that I decided to experiment on my own instead and came up with a variation of Peter Reinhart’s San Francisco sourdough using durum flour, stone ground barley flour and some roasted wheat germ as well. I was very happy with the results with the exception that I didn’t do a great job of shaping the loaves and they became slightly misshapen. I do have to say though that the malformed shapes fortunately did not affect the taste. The crumb was a little tighter than I would have preferred, but overall the bread had a nice nutty sweet flavor and went well with my wife’s bow-tie pasta and chicken in a cream sauce she made tonight for dinner. If anybody decides to try this for themselves, I would love to hear about your results. Add the flours, salt, yeast (if using), and mix on the lowest speed for 2 minutes. Let rest for 5 minutes. I recieved my new delivery from King Arthur Flour the other day so decided to use some of my new ingredients and threw together a sourdough bread with eggs and corn flour (it’s supposed to be finer and less gritty than corn meal). 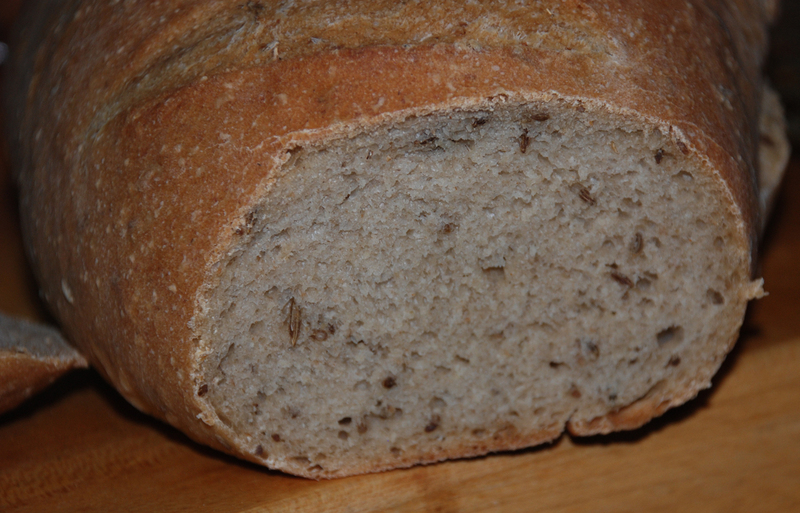 I also decided to add some Barley flour which I find adds a nice nutty flavor to the bread. 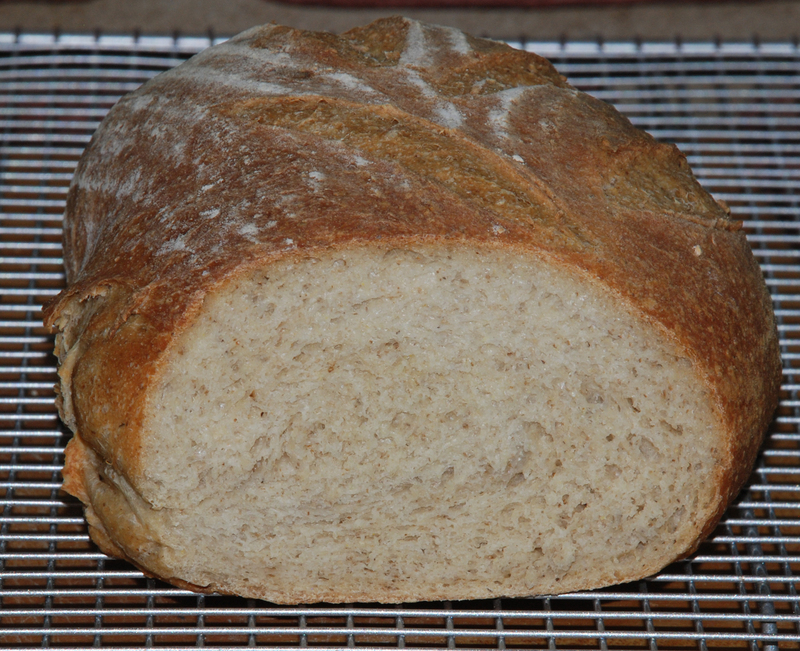 The final loaf was a little dense, but overall I was satisfied with the end result. 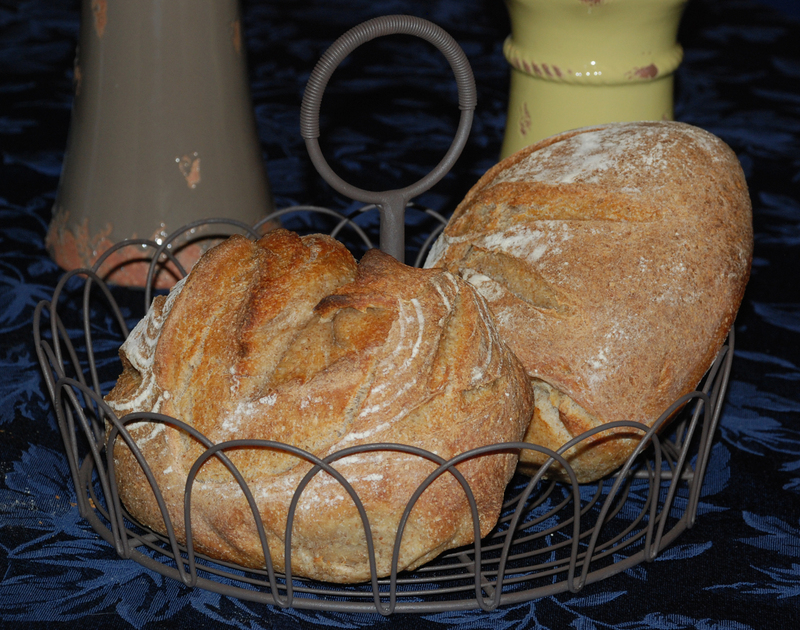 This bread is perfect for a hearty stew or simple toast and butter or jam in the morning. I was in a creative mood the other day and after my wife fried up some bacon I felt inspired to use the leftovers in a bread. You know what they say…..”bacon makes everything taste better”. 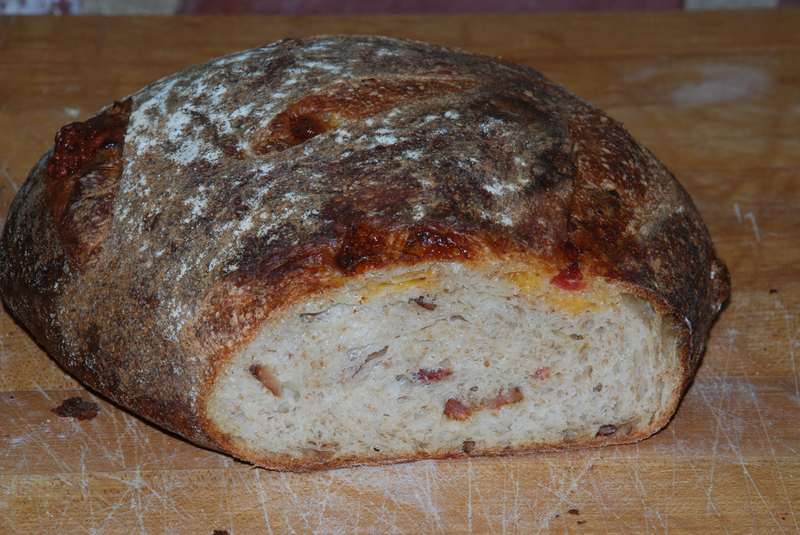 It’s hard to argue with this logic, so I decided to combine the bacon with some cheddar cheese, toasted onions and added some wheat germ I just bought from King Arthur Flour to add some nuttiness to the overall flavor profile. I boiled some potatoes and left the skins on when mashing them up since I like the flavor and look of the charred bits of potato skin in the finished bread. 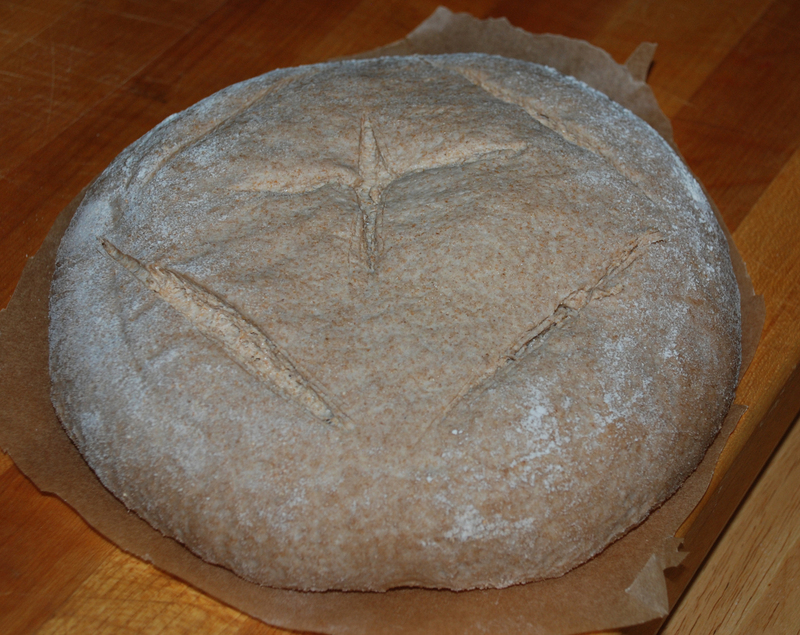 I decided to combine Durum Semolina flour and KAF European Bread Flour (you can use regular bread flour if preferred). I do have to say I was not disappointed with the end result as it has a nice hearty bacon flavor with bits of cheese that makes it hard to stop eating. I made 2 loaves and was going to freeze one for later in the week, but I have a feeling I will end up finishing both loaves in the next couple of days. 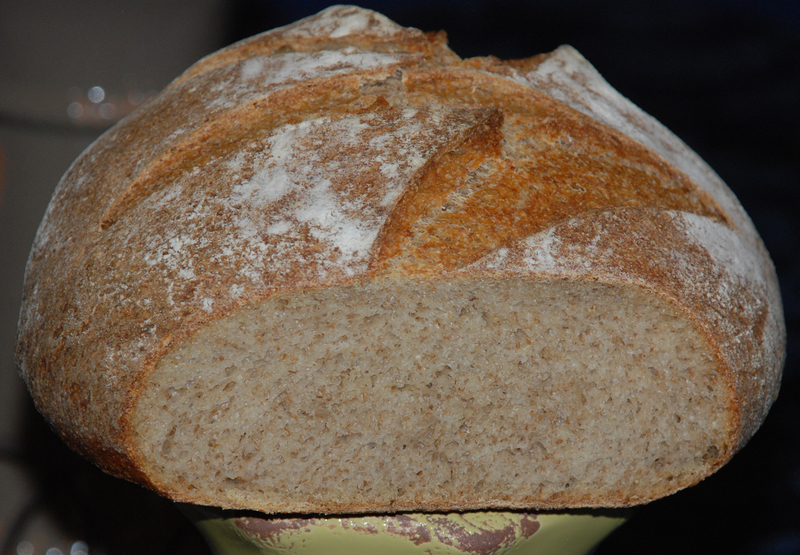 It’s a cold and snowy day here on Long Island, NY and this bread goes perfectly with soup or chile which my wife is planning on making for dinner tonight. If you decide to try this, feel free to add some additional bacon to give it even more bacon flavor. Add the flour, potatoes, salt, yeast (if using), and mix on the lowest speed for 2 minutes. Let rest for 5 minutes. Add the bacon (note if you shred the cheese you can add it now, otherwise I suggest kneading it into the bread by hand which is what I did). Remove dough to your lightly floured work surface and need for 1 minute and form into a ball. Flatten into a rectangle and add the cheese and form dough into a ball. I have been baking up a storm this week since I am about to venture off to China for 12 days for my first trip of the New Year. I travel to China for business 4-5 times a year visiting the factories that make my company’s sporting good items. Anyway, I can tell you that good bread is definitely hard to come by in China so I think I may bring some with me this trip! I decided to try and make a recipe from Dan Leader’s Local Breads and settled on the Whole Wheat Sourdough Miche, inspired by Pain Poilane. 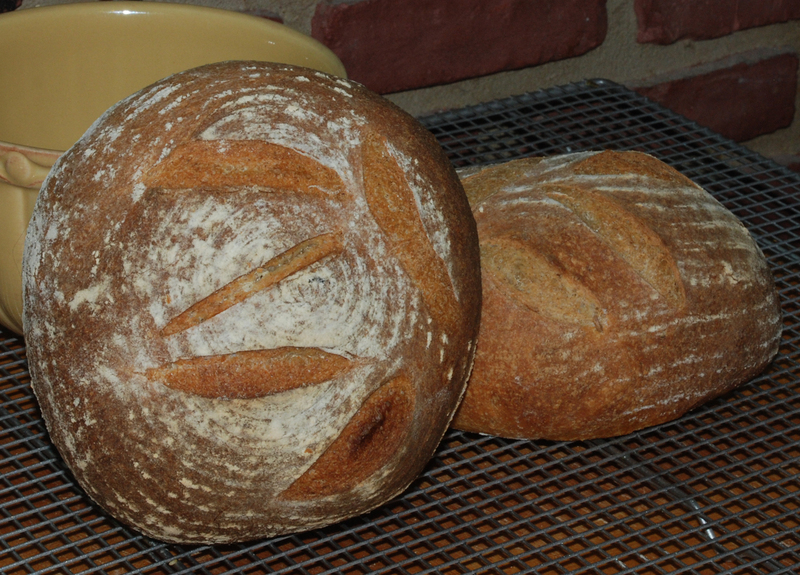 This is supposed to be light and tangy bread and is so large that it is ideal for stenciling if one desires. I didn’t have the time to do the stenciling effect, but I may give it a try the next time. I followed his directions pretty closely and converted my white flour sourdough starter at 68% hydration to a whole wheat starter at 80% hydration. 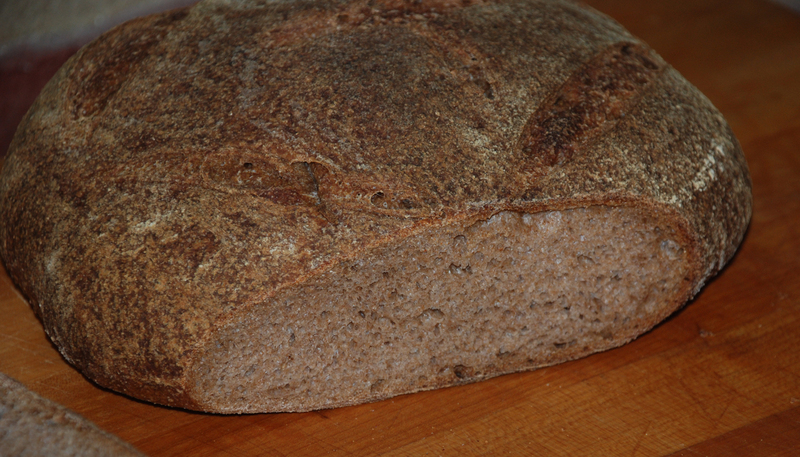 His starter may be slightly different as he started with a Stiff Dough Levain that included a small percentage of Rye Flour as well as all-purpose four, while mine started off with bread flour only and was converted to a whole wheat starter only. 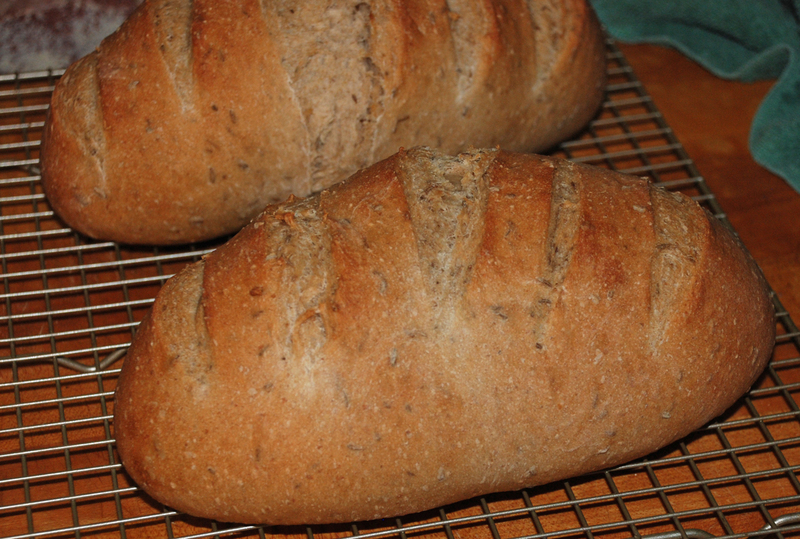 I have tried making some of his bread before, and it seems every time he says it should bulk ferment for a couple of hours it seems to take me 3 times as long. 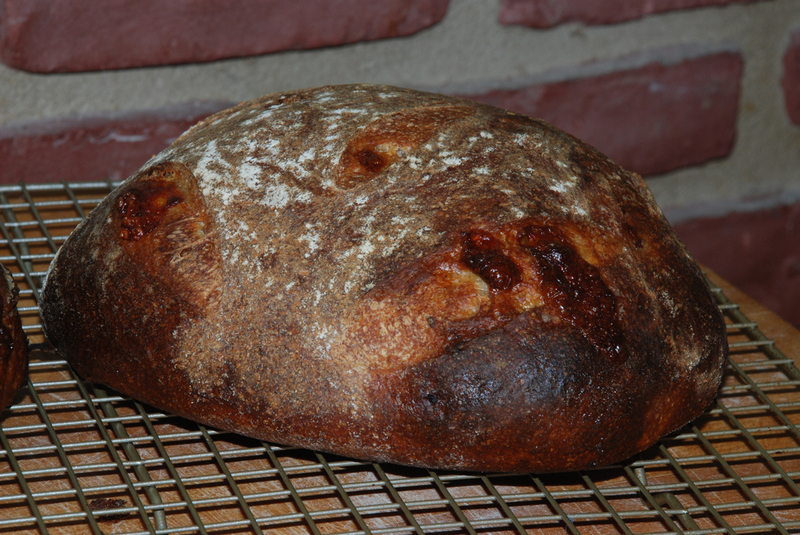 It took so long to ferment the dough for the first rise that I ended up refrigerating the shaped Miche and baking it the next day. I believe that probably caused the end product to be even more sour tasting than it would have if I had baked it the same day. Pour the water into the bowl of your stand mixer and add the flours and mix just until the flour absorbs all the water and a rough dough forms. Cover the bowl with plastic wrap or a towel and let it sit and hydrate for 20 minutes. This will allow the gluten to start developing without too much mixing. 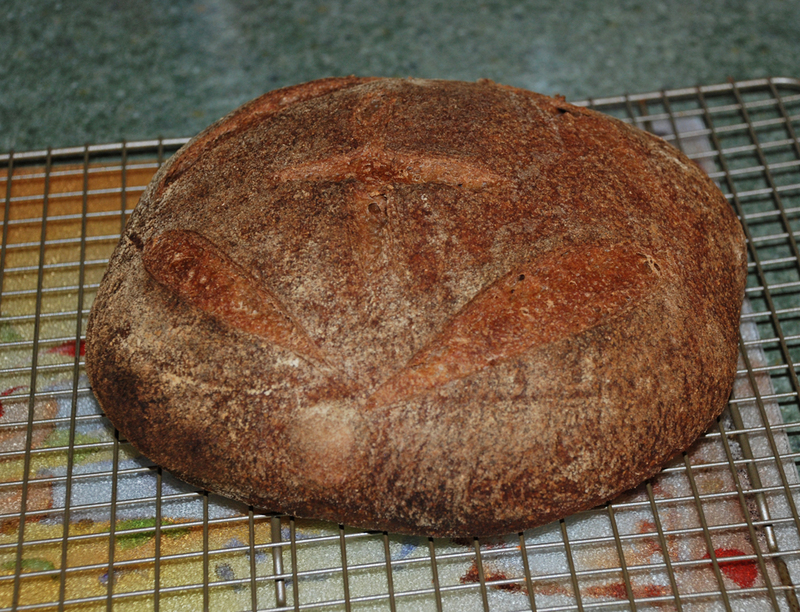 After 20 minutes, add the Levain (starter) and the salt to the dough and work it into the dough. The original instructions are very confusing here and say to add only 4.4 ounces/125 grams of the starter, but in the ingredients list it includes the entire amount. I added the entire amount of starter to the dough and mixed it in with the salt. The original recipe also says to add it in with a spatula but I turned my mixer on low and added it in this way. If you have a dough hook for your mixer, switch to that attachment (I have a Boche Mixer which only has one mixing/kneading attachment for bread). Knead the dough on medium speed until it is glossy, smooth and very stretchable for about 10 – 12 minutes. The dough will not necessarily clean the sides of the bowl so you may need to scrape the sides down once or twice during the kneading process. The book says to use the window pane test to judge if it is ready and if not to continue kneading until you can pass the test. This means you tear off a small piece of dough and stretch it thin so you can see through it without it ripping. Next, remove the dough from your mixing bowl into a lightly oiled (I use Pam or Baking Spray) plastic or glass container and make a mark to indicate where the dough needs to rise to double in size. Let it rise at room temperature, 70 to 75 degrees until it doubles in size. Make sure you cover the bowl. ( The book says this should take an hour, but my kitchen was only 68 degrees and it took around 3 hours to finish the first fermenting). 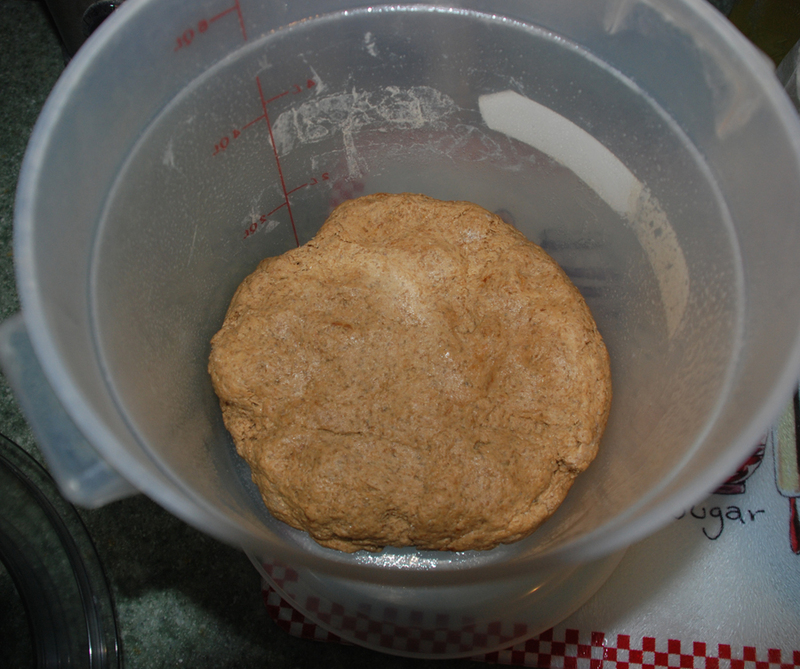 After it doubles in size, remove the dough from the container and knead it on a lightly floured or oiled surface for a couple of minutes to stimulate the yeast with some fresh oxygen. 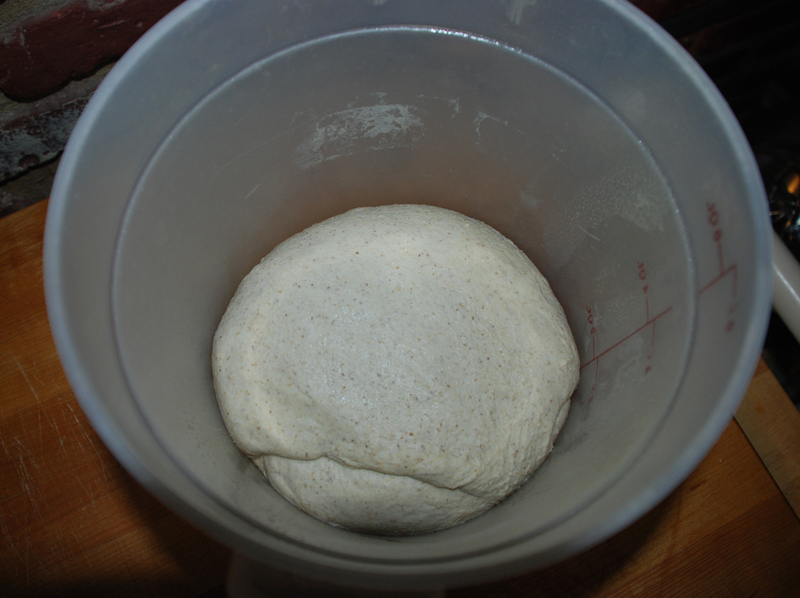 Return the dough to the container and cover until it doubles in size again. This should take 2 – 3 hours. 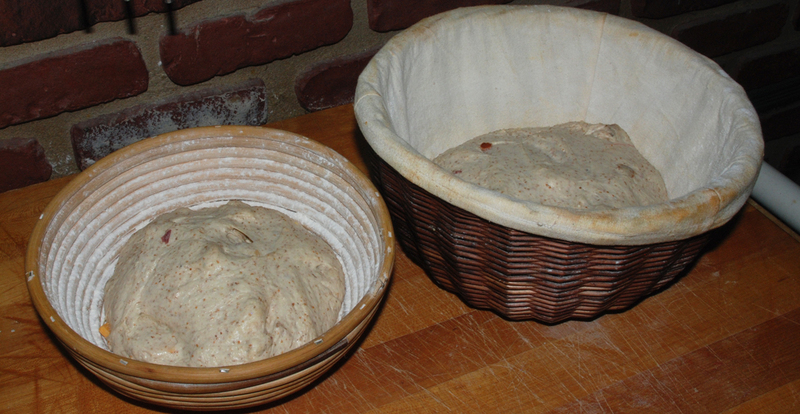 Once the dough has risen properly, flour a banneton or a bowl lined with a floured kitchen towel. Next turn the dough onto a lighlty floured surface and form into a miche by tucking the edges of the dough underneath the bulk as if you are making a bed, to shape a rough round. 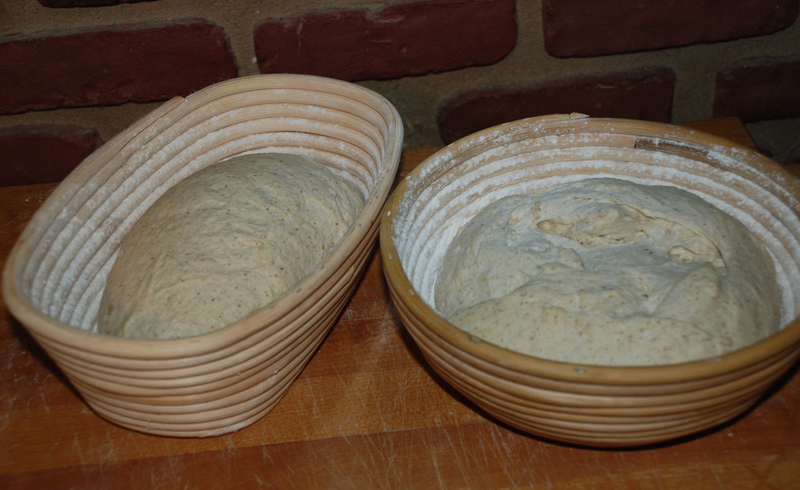 Now place your hands on the side of the round and move them in a tight circle as you pull the dough towards you. You don’t need to make it perfectly round, but be sure to pinch the bottom edge to seal the dough. Place the miche into your banneton or lined bowl, seam side up and cover with a lightly oiled plastic wrap or kitchen towel sprayed with a mist of water. 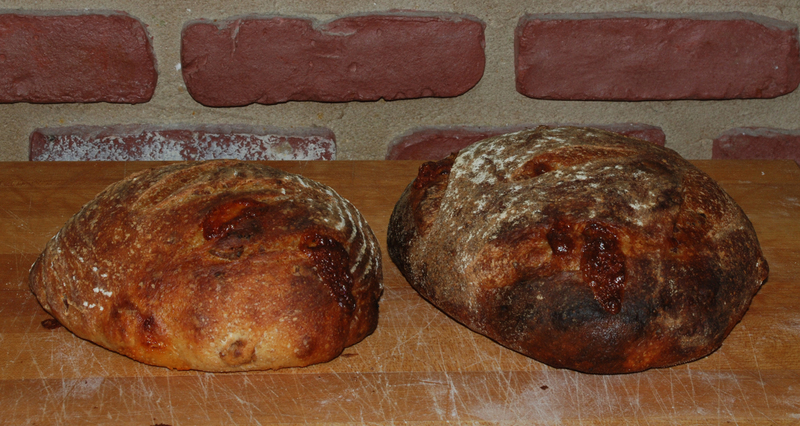 Now proof the Miche at room temperature for 2 to 3 hours until it doubles in size. When it is ready to bake if you press your finger into the dough the indentation should spring back slowly. (This is where I ended up putting it in my refrigerator for 24 hours). 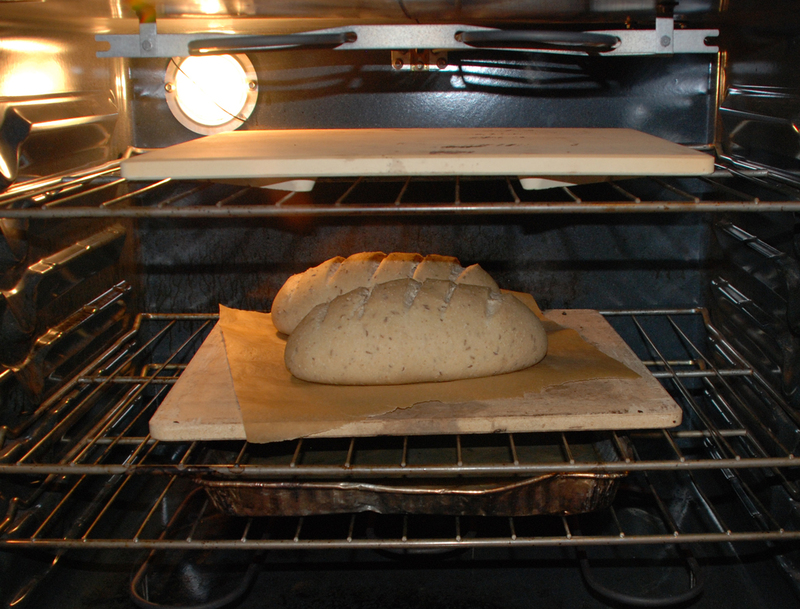 About 1 hour before baking, place a baking stone on the middle rack of your oven with another rack right below it. Add a metal or aluminum foil pan on the bottom rack. You can also use a cast iron skillet if you prefer. Preheat your oven to 470 degrees. 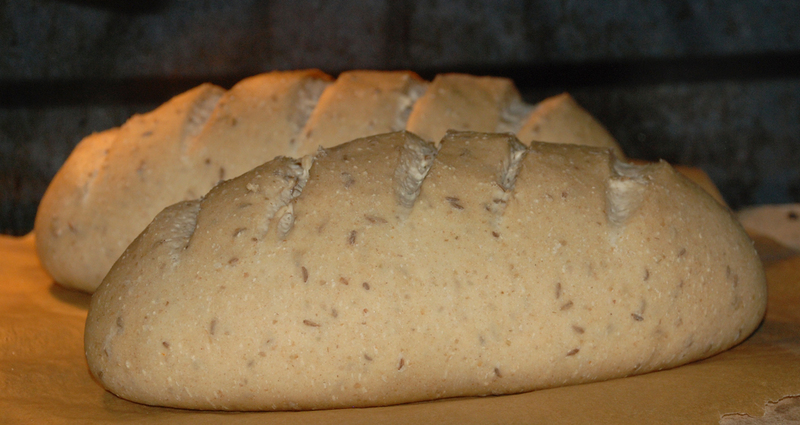 Once the oven comes up to temperature, turn the Miche out onto a bakers peel with parchment paper and score the loaf as desired. 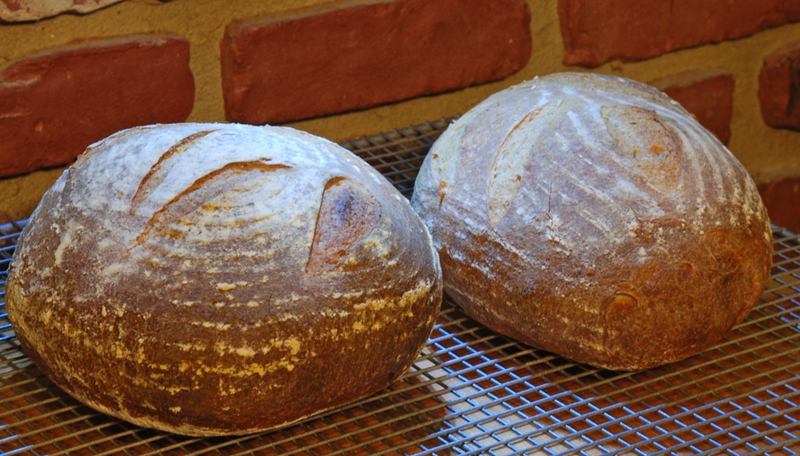 Slide the Miche onto your bakers stone and immediately pour 1 cup of boiling water into the pan in the oven. I also like to use a spray bottle and spray the sides of the oven 2 times in 30 second intervals. Bake for approximately 40 to 50 minutes until the crust is walnut brown and the internal temperature is around 200 degrees. Let the loaf cool for at least 2 hours before slicing.